In 1877, photographer John Thomson and radical journalist Adolphe Smith published “Street Life in London” in twelve monthly parts. 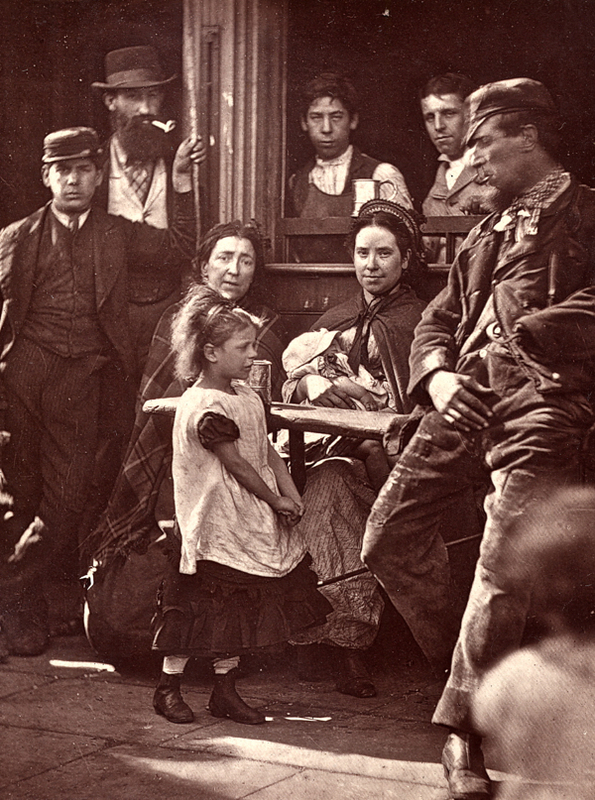 A series of portraits of common people following upon the model of Henry Mayhew’s “London Labour and London Poor,” adding photography to the project. “We have sought to portray these harder phases of life, bringing to bear the precision of photography in illustration of our subjects. The unquestionable accuracy of this testimony will enable us to present true types of the London poor and shield us from the accusation of either underrating or exaggerating individual peculiarities of appearance.” wrote the authors in their joint preface. At first, I was attracted by the evocative photography yet suspicious of the dubious claim of scientific detachment, but when I read this plain account of the life of a man in Whitechapel my sympathies shifted. 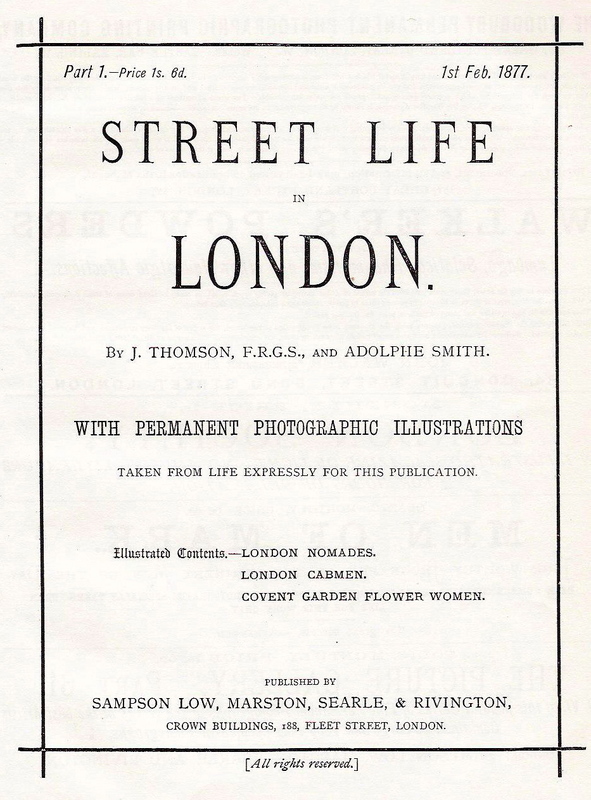 In fact, “Street Life in London” provided sympathetic interpretation of the lives of the poor for curious middle class readers who wanted to learn more about their fellow men and women. In the photograph before us we have the calm, undisturbed face of the skilled artisan who has spent a life of tranquil, useful labour, and can enjoy his pipe in peace, while under him sits a woman whose painful expression seems to indicate a troubled existence, and a past which even drink cannot obliterate. By her side, a brawny, healthy “woman of the people” is not to be disturbed from her enjoyment of a “drop of beer” by domestic cares and early acclimatizes her infant to the fumes of tobacco and alcohol. But in the foreground the camera has chronicled the most touching episode. A little girl, not too young, however, to ignore the fatal consequences of drink, has penetrated boldly into the group, as if about to reclaim some relation in danger, and drag him away from evil companionship. There is no sight to be seen in the streets of London more pathetic than this oft-repeated story – the child leading home the drunken parent. The most remarkable figure in this group is that of “Ted Coally” or “Hookey Alf,” as he is called according to the circumstances. His story is a simple illustration of the accidents that may bring a man into the streets, though born of respectable parents, well-trained and of steady disposition. This man’s father worked in a brewery, earned large wages, married, kept a comfortable home, and apprenticed his son to the trunk-making and packing trade. The boy frequently helped to affix heavy cases to a crane, so that they might be lowered from the top floor of a warehouse into the street. As the boxes were lined up it required considerable strength to push them out of the loop-hole out into the street, and, the young apprentice having inherited his father’s stalwart form, was selected for this work. On one occasion, however, he threw the whole of his weight against a huge case which, through some mistake, had not been lined with tin; of course the case yielded at once to so tremendous a shock, it swung out into the street, and the lad carried away by his own unresisted impetus, fell head foremost to the pavement below. This accident at once put an end to his career in the trunk and packing trade, and rendered all the expense of his apprenticeship useless. He recovered, it is true, from the fall, but has ever since been subject to epileptic fits. Finding that under these circumstances, he could no longer attempt complicated and difficult work, he thought he would seek out his living in one of those occupations where mere muscular strength is the chief qualification required. Thus he was able for some time to make his living as a coal porter but, even in this more humble calling, fate seemed to conspire against him. While high up on an iron ladder near the canal, at the Whitechapel coal wharfs, he twisted himself round to speak to someone below, lost his balance and fell head first to the ground. Hastily conveyed to the London Hospital, it was discovered that he had broken his right wrist and his left arm. The latter limb was so seriously injured that amputation was unavoidable, and when Ted Coally reappeared in Whitechapel society, a hook had replaced his lost arm. Thus crippled, he was no longer fit for regular work of any description, and having that time lost his father, the family soon found themselves reduced to want. “Hookey Alf,” as he was now called, did not, however, lose heart, and, pocketing his pride, he wandered from street to street in search of any sort of work he could find. Hovering in the vicinity of the coal-yards he often met his old fellow-workers, and whenever a little extra help was required they gladly offered him a few pence for what feeble assistance he could render. Gradually he became accustomed to the use of his hook, and proved himself of more assistance than might have been anticipated, but, nevertheless, he has never been able to secure anything like regular employment. He may often be found waiting around the brewery in the Whitechapel Rd, where ten or twelve tons of coal are frequently taken during the course of the day. “Hookey” stands here on guard, in the hope that when the coal arrives there will be some need of his services to unload. On these occasions he will earn a meal and few pence, and with this he returns home rejoicing. But, if after a long day’s patient endeavour he fails to make anything, the worry and disappointment will probably cause an attack of epilepsy, and thus add ill-health to poverty. The tender concern of his mother cannot soothe the wounded feelings of the strong man. The energy and will are still there, it is the power of action alone that is wanting, and this good-natured honest man, feels he ought to be supporting his mother and sister, while in reality he is often living off their meagre earnings. The position is certainly trying, and it is difficult to make poor “Hookey” understand that an epileptic cripple cannot be expected to fulfil the same duties as a man in sound health. Perhaps the lowest depths of misery were reached when “Hookey” in despair, slung a little string around his neck to hold in front of him a box or tray containing Vesuvians, and presented himself at the entrance of a neighbouring railway station, and sought to sell a few matches. “Hookey’s” misfortunes will, however, serve for one good purpose. They demonstrate that even those who resort to the humblest methods of making money in the streets are not always unworthy of respect and sympathy. Many cases of this description might be found “Whitechapel way,” by those who have the time, energy and desire to seek them out. It will always be found that those who have the best claim to help and succour are the last to seek out for themselves the assistance that they should receive. It is only by accident that such cases are discovered, and hence my belief that time spent amongst the poor themselves is far more productive of good and permanent results, than liberal subscriptions given to institutions of which the donor knows no more than can be gleaned from the hurried perusal of an abbreviated prospectus. In this manner Dickens acquired his marvellous stores of material and knowledge of the people. Exaggerated as some of his characters may seem, their prototypes are constantly coming on the scene, and as I talked to “Hookey” it seemed as if the shade of Captain Cuttle had penetrated the wilds of Whitechapel. To be honest, examining the picture, I cannot discern the “painful existence” of the woman from her “troubled expression” with “unquestionably accuracy” (as Thomson and Smith intended), though I was not there when the photograph was taken to learn the full story. It would be easy to distance ourselves from this pitiful tale of “Hookey Alf” by dismissing it as illustrative of the world before employers’ liability and incapacity benefits, yet it remains a common sight today to see people with visible disabilities on the streets of East London who are either begging or selling the Big Issue. I respect Adophe’s engagement with “Hookey Alf’s” feelings of frustration, humiliation and desperation, drawing the reader to empathise with his subject, creating a sympathetic portrait that anyone with an ounce of humanity can recognise. Significantly, Dickens is the touchstone when it comes descriptions of the common people of London. And I feel that Adophe is evangelically persuasive in arguing the case for the moral integrity of the man to refute a contrary voice that, like Ebenezeer Scrooge, is condemning the poor as feckless and irresponsible. Most interesting and radical is Adolphe’s proposal to his educated readers that they might actually consider spending time among the poor, engaging directly with their fellow humans, rather than merely making charitable donations to salve their guilt. Living in the city, it is hard not to become inured or indifferent to those who ask for money in the street, but Adolphe Smith’s article speaks across more than a century to remind us, if we should need it, that “those who resort to the humblest ways of making money in the street are not always unworthy of respect and sympathy”. Poor Hookey Alf, why has no one commented? I am going to then! I agree completely that the evaluation of the photograph is less than objective. They really are imposing their own (in several places probably quite ignorant) beliefs. But generally I like the points he makes about Alf, who was obviously a very honourable, determined and unlucky person. I found the description of his struggle all the more touching because I could never for a second relegate it completely to the (pre welfare state) past. Talking to the chronically ill/injured or jobless today reveals the same emotions and struggles in many cases, even though of course the benefits may put a cushion between them and the desperation of the nineteenth century poor. Sometimes it is a thinnish cushion. And yes, it takes personal engagement with the poor to find these things out, and to deal with the misconceptions of those who misunderstand what they have never witnessed or experienced first hand. How irritating to see people form opinions that their personalities would reject within minutes of actually seeing the realities of the lives they are judging! I’m sure I must do it myself all the time. I salute Alf, and anyone else who managed to struggle on and keep trying in circumstances like his! What a sad but touching story. So many of the photographs of old London convey people that seem to have lives full of such hardship, who struggle on a daily basis just to survive. It really puts things in perspective. I am always amazed at the daily facts of Victorian life – and how much has changed in 138 years. We might as well be on different planets. Yet, with all our “progress”, we still have the Four Horsemen with us. Then or Now, which is better?